We consider the problem of reconstructing the combinatorial structure of a set of \(n\) points in the plane given partial information on the relative position of the points. This partial information consists of the radial ordering, for each of the \(n\) points, of the \(n-1\) other points around it. We show that this information is sufficient to reconstruct the chirotope, or labeled order type, of the point set, provided its convex hull has size at least four. Otherwise, we show that there can be as many as \(n-1\) distinct chirotopes that are compatible with the partial information, and this bound is tight. Our proofs yield polynomial-time reconstruction algorithms. 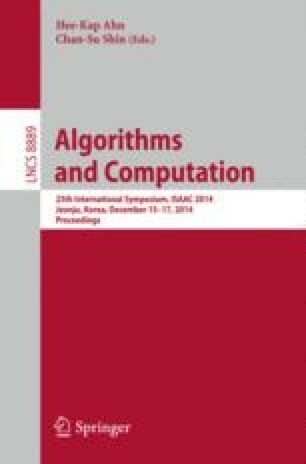 These results provide additional theoretical insights on previously studied problems related to robot navigation and visibility-based reconstruction. O. Aichholer is partially supported by the ESF EUROCORES programme EuroGIGA, CRP ComPoSe, Austrian Science Fund (FWF): I648-N18. J. Cardinal is partially supported by the ESF EUROCORES programme EuroGIGA, CRP ComPoSe, and the Fonds National de la Recherche Scientifique (F.R.S. - FNRS). V. Kusters is partially supported by the ESF EUROCORES programme EuroGIGA, CRP GraDR and the Swiss National Science Foundation, SNF Project 20GG21-134306. Part of the work was done during an ESF EUROCORES-funded visit of V. Kusters to J. Cardinal. S. Langerman is Directeur de Recherches du F.R.S.-FNRS.